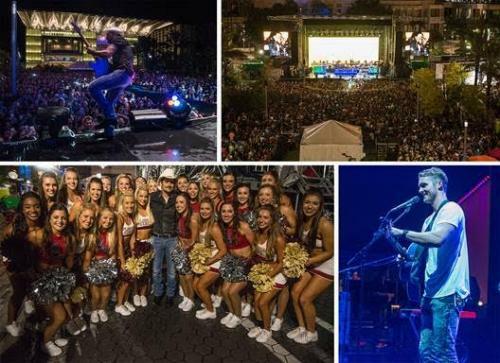 This past weekend Brad Paisley kicked off his celebration of the 2016 college football season by taking his Country Nation College Tour presented by Frontier Communications to Downtown Orlando. He provided a free show for Ole Miss and Florida State fans, and the Central Florida community, in advance of the Camping World Kickoff game which was held on Monday, September 5. Despite the downpour of rain right before showtime Paisley played to an enthusiastic capacity crowd. Special guest on this stop of the college tour was California native and singer/songwriter Brett Young. This coming weekend the Country Nation College Tour presented by Frontier Communications will travel to Paisley's home state of West Virginia for a show at WVU on Friday, September 9. This show will be filmed by City Drive Films and is slated to air later this year as part of the new live concert and travel series entitled "Landmarks Live in Concert." It will also be released as a DVD with a live CD component this Christmas. Multi-platinum recording artist Chris Young will be special guest for the WVU show.